Different Coverage Types of Business Fire Insurance | The Voss Law Firm, P.C. Business owners have a lot of options when it comes to protecting their investments from fire damage. While fire coverage is often bundled as part of a property insurance policy, there are many differences between the forms of coverage—and choosing the wrong one can leave business owners on the hook for the costs of their losses. Attorney Bill Voss examines the many types and exclusions involved in commercial fire insurance policies, helping business owners choose the form of coverage that best suits their needs. Basic Form. As its name suggests, a basic policy offers the least amount of coverage. Basic form policies spell out which causes of loss (called perils) will be covered. If a peril is not specifically mentioned in the policy, it will not be covered. Some examples of coverage in a basic fire policy may include fire caused by lightning, explosions, or vandalism. Since these policies do not offer much protection, they are commonly used to insure properties that are vacant or undergoing a remodel. Broad Form. These policies cover all of the same perils in the basic form, plus other specific hazards that are spelled out in the policy. Just as with basic coverage, any peril that is not expressly named will not be covered. 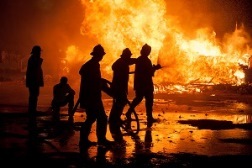 Some examples of broad form fire insurance options may include fires started by vehicle collisions or foam and water damage from firefighters. Special Form. Special form coverage is the most expensive of the three insurance options. Instead of listing the covered perils, special form policies list the perils that are excluded from coverage. Any peril that is not listed will automatically be covered, making it the most comprehensive form of fire insurance. Which Commercial Fire Damage Coverage Should I Choose? In most cases, special form coverage is ideal for business owners because of its inclusive nature. However, the high cost of premiums may place this coverage out of reach of some business owners. Fortunately, choosing your coverage carefully and selecting a few “add-on” options can allow many property owners to get affordable coverage that will cover the most common types of losses. Type of business. The majority of fires are started by human hazards rather than natural ones. If you have a business that involves residents (such as an apartment buildings or a hotel), the risk of fire increases. If your structures include fireplaces or gas heating, the risk is even higher. Age of the structure. Not only does the risk of fire increase with the age of the building, it is usually more costly to repair damage to an older structure. The reason for this is that older structures may be several decades behind modern building codes. In order for your repaired structure to pass inspection, it must meet current state and federal codes. If your building is over fifty years old, it may be worth purchasing additional building ordinance coverage to pay for the extra cost of upgrading to modern building codes. Optional extras. Many types of excluded coverages on basic or broad form policies can be added on a la carte. For example, you may be able to add on coverage for fires due to vandalism or coverage for the restoration of data lost from your computer systems. Risk of excluded coverage. No matter what kind of policy you purchase, you should carefully examine every peril that is expressly excluded. In most cases, damage done by earthquakes, power failure, neglect, war, and arson are excluded even under special form policies. Some may refuse to pay for damages to the land or the foundations of the building. Depending on your needs, it may be worth seeking additional coverage for the exclusions on your policy through another insurer. If you are having trouble getting fair payment after a fire at your business, we can help. Simply fill out the form on this page today to contact the Voss Law Firm or order a free copy of our book, Commercial Property Owners Must Read This BEFORE Filing an Insurance Claim.